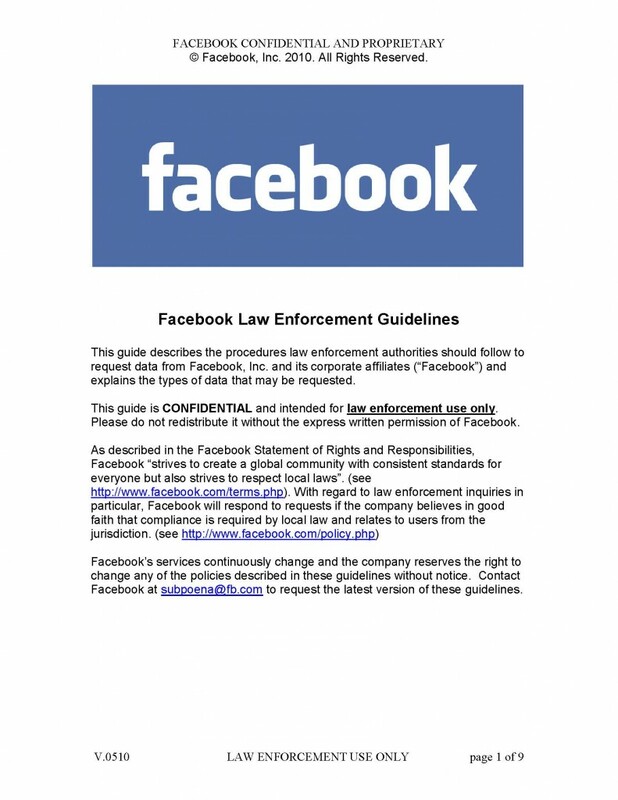 This series of documents represents all publicly available versions of Facebook’s subpoena and legal compliance guides produced for law enforcement information requests. This site previously published the Facebook law enforcement guides from 2007-2010, which included a 2008 version of the manual that was originally published by Cryptome. The guides were referenced by privacy scholars and others in the media, yet Facebook would not even confirm to Reuters the authenticity of the documents. With two more editions provided by the latest #AntiSec leak (including a second expanded copy from 2010 and a shorter version from 2006), there are now 6 separate versions available from 2006-2010. All but one of the guides are labeled with version numbers documenting the evolution of the Facebook process for supplying user information to law enforcement. If you have other editions of the manual, please consider submitting them via our online submission form.